Thought to be New South Wales longest continuing running ocean swim with its first start in 1974, THE BIG SWIM presented by the Whale Beach Surf Lifesaving Club in association with Macquarie is a journey swim, not around the buoys in a bay, or up and down a beach outside the break but a true ocean swim, from Palm Beach to Whale Beach around the headland through the Tasman Sea. Held on the last Sunday of January each year with a distance of 2.5 – 2.8 km, it is known as THE BIG SWIM because it is BIG, conditions vary from dead calm to testing south-easterly or uncomfortable nor’easter’s which can arrive early in summer with swells from all directions making for challenging swimming when you breathe to the left. It is a huge achievement to complete one swim and some have swum in over 30 swims! This year’s swim is on Sunday 28th January, 2018 and as a precursor the URM Little Big Swim commences at 830am with an 800 metre swim around kiddies corner at Palm Beach. This is a perfect introduction to open ocean swimming with enormous water safety and a fabulous location for a short course swim. With registration from 7.30am for both events, the Big Swim starts off with the Elite group of swimmers at 10.00am. Free transport from our PARKING AREAS at Careel Bay soccer fields or arrive early for a beachside carpark. 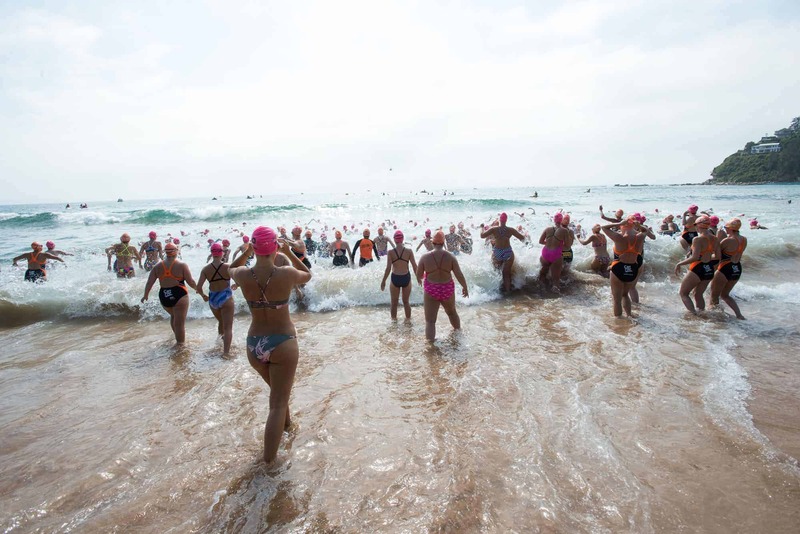 This is the final event of the Pittwater Swim Series where by competing in just 3 of the northern beaches swims you can win a trip to the Byron Bay swim.